Proof that one bad egg can spoil Earth’s view of an entire alien race! For the length of human history, we’ve attempted to reach out into the darkness and communicate with what’s beyond the world we can see. Psychologist and astronomer Mark attempted to do exactly that in the Stan Lee-Jack Kirby story that led 1961’s TALES OF SUSPENSE #15. The response he received confirmed many fears people have about outsiders. Upon landing on Earth, Goom demonstrated his abilities by flying around in the planet’s lesser gravity and brandishing mountain-disintegrating ray guns. He then held Mark’s girlfriend Helen captive, forcing the young man to address the world’s officials and tell them that Goom just wanted a peaceful meeting. With a larger crowd, Goom used his technology to turn a man into a baby and send a city flying into the air! Realizing that Earth had been outmatched, Mark made one desperate attempt to contact Planet X once again. 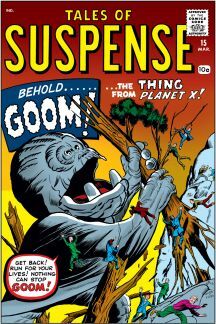 Misconstrued as a traitorous act, the call actually brought about Goom’s fellows who appeared in time to reprimand the “sick renegade” and take him back home. 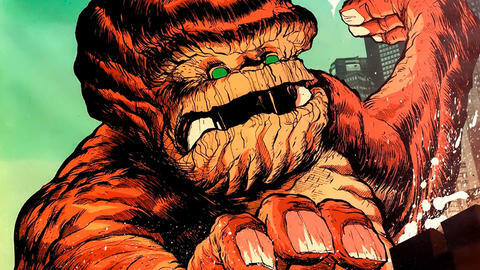 Thanks to his delightful name and iconic appearance, Goom has continued to be a favorite of writers and artists looking to fill out the ranks of whatever monster group their heroes find themselves facing. He’s been a captive of The Collector, a resident of Monster Island and a prisoner of S.H.I.E.L.D.’s Howling Commandos. The Space Beasts prove that they need to do a little more research when invading planets in TALES TO ASTONISH #29.